If you are reading this you probably already know the statistics about obesity, diabetes, and other public health crises caused in large part by sedentary lifestyles and by built environments that promote automobile dependence and discourage walking and bicycling. 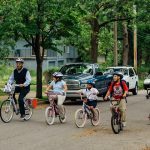 Greater Kansas City’s rates of bicycling and walking are less than half the national average, which is a big contributing factor in our above average obesity and diabetes rates. Historically Kansas City has had poor infrastructure for encouraging people to bicycle and walk, but fortunately much progress has been made in recent years and critical mass is building for a cultural shift. Several cities have begun adopting trail plans to help realize the MetroGreen vision. • Bicycle lanes have been or are being installed in Kansas City, Grandview, Olathe, Lee’s Summit, Blue Springs, Shawnee, Olathe and Leawood. • MoDOT recently opened not one but two bike/ped crossings over the Missouri River – a monumental development that bridge long-standing physical and psychological divides and open up new commuting options for many Kansas Citians. 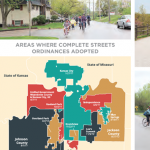 • There are also small-scale neighborhood development’s like Rosedale in Kansas City, KS, which is working to add bike lanes to Merriam Drive, a popular corridor for bike commuters that connects KCKS with KCMO and Johnson County. Developments at the policy level are also starting to reinforce the growing physical infrastructure. Kansas City recently reformed its development code with bike-friendly things like bicycle parking requirements in new development or redevelopment. KCMO is also including some good bike/walk investment targets in its new climate protection plan. Finally, Lee’s Summit just adopted the metro’s first Complete Streets policy, an idea that seeks to design streets for all users—bicyclists, pedestrians, children, seniors, transit users, etc.— not just motorists. Education and outreach programs are growing and reinforcing the cultural shift towards active transportation. 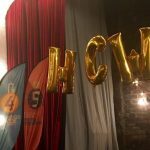 Bike Week and the Car Free Challenge are getting people out of cars and onto their own two feet. The Share the Road Safety Task Force is working to educate motorists, bicyclists, and pedestrians about safety and helping police better enforce the laws that keep all roadway users safe. Kansas City certainly has some significant physical and cultural challenges to overcome, but the various stakeholders across community groups, advocates, government and public health are finally coming together around a common vision of community where active transportation is a way of life for healthy people, livable neighborhoods, a competitive economy, and a sustainable environment. Eric Rogers is Vice-President of the Missouri Bicycle and Pedestrian Federation, and chairs Kansas City, MO’s Bike/Ped Advisory Committee. He blogs about local bicycle culture at www.KCBike.Info.